If there’s one thing most people neglect on a daily basis, it’s taking care of their physical health. Statistically, those who simply increase their intake of water and daily cardio live longer, healthier lives. In honor of World Health Day on April 7, we’ve curated a list of 15 free and useful apps to keep you motivated and movin’. Check out the list of apps that’ll help you stay fit and healthy. As a bonus, we’ve updated this article since its original publication to include 5 additional apps that have gained popularity in 2019! Enjoy jogging outside, but want to add a little fun to your run? Thanks to this app, running or jogging will never be boring again. Zombies, Run! is an app which combines playing video games and working out. As you run, you get to keep humans safe from zombies, collect materials for your camp, and carry out important missions. It’s no wonder that this app became the highest-grossing health app on iTunes. And, of course, it is also available for Android phones. 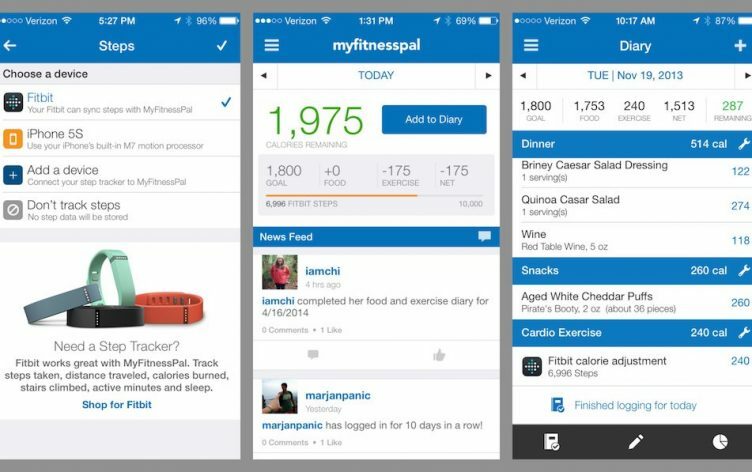 My FitnessPal is an app that has been around for quite a long time and there is a reason why it is one of the top-rated health apps. This app helps you keep track of your diet easily. It has a database of more than 5 million foods and nutrition information for thousands of restaurants. In addition, it allows you to create meals which you can add at all times instead of having to enter individual ingredients every time you eat something. Plus, you can sync My FitnessPal with other fitness-tracking devices and apps. Sworkit stands for “simply work it,” and will help you get on track with your fitness goals. This app is perfect for anyone who wants to be active, but can’t commit to a gym. The app helps you to determine your current fitness level and then tailors a six-week program based on your needs, including how much time you want to spend working out. Lifesum makes tracking your nutrition a breeze and can even act as a lifestyle coach. The app will regularly remind you to eat, drink water, and will give you some useful lifestyle tips. Once you take a quick survey that gives the app greater insight into your goals and lifestyle, it can start giving you recommendations that will help you make healthy changes in your life. Working out and proper diet are not the only factors that influence your health. In order to improve the quality of your life, you should make sure to keep stress in check. The best way to do this is with the help of meditation. The Calm app can guide you through different types of mediations or simply play natural sounds that will help you calm down and get rid of stress. Stressed at work? Pop in some discreet earbuds like the Rowkin Bit Charge Stereo and get a small relaxation session right at your desk. If you love going to the gym, then JEFIT is an app that can help you track your workouts. This app won’t plan out your workouts, but it will allow you to record your reps and weights. If you want to switch up your routine, you can always check out more than 1,300 exercises that are stored in the database. Or, if you don’t like choosing the exercises by yourself, you can choose from hundreds of user-generated workouts. Not getting enough sleep will not only affect your mood, but also your health. This app helps you wake up refreshed every morning and it diagnoses your sleep deficits (if you have any). The best thing about this app is that it has a feature called the smart alarm. This alarm will wake you up in your light-sleep-stage cycle which is much healthier than waking up from a state of deep sleep. Have you heard of Cassey Ho, one of the most popular pop-pilates instructors on YouTube? Well, she has developed her own app both for iOS and Android smartphones. The Blogilates app gives you access to all of Cassey’s videos from one place, a monthly workout calendar, and an online forum. There are many people who dream of being able to run a marathon, but they simply don’t know where to start. If you are one of these people, Couch to 5K is your go-to app. This app includes an eight-week program, requiring only three days per week. 9 weeks later and you’re all set to hit the ground runnin’. We all know the amazing benefits of yoga, especially if it’s the first thing you do in the morning. Yoga Wake Up will deliver a 10-minute sequence every day at your designated wake-up time. Of course, each sequence will be different. Some days you will focus on meditation and others on setting intentions. Doing yoga just got a whole lot easier! Let’s say that you don’t like any of the previous apps because you still feel like you lack free time. What if we say you only need 10 minutes? Actually, you won’t need even 10 minutes, because this app delivers you 7-minute long workouts which range from total-body routines to body-part specific. Training 7 minutes a day will not make you the next Bruce Lee, but it will get you moving and in shape. Nike is a brand that helps countless athletes all over the world reach their full potential. It’s no wonder that it has a few apps up its sleeve as well. Nike+ Training Club has all the things a top-notch fitness app should have – workouts designed by professionals, customizable fitness plans, and a sleek interface. The workouts will help you build strength and endurance. In addition, you can also turn on the audio instruction from athletes and coaches for extra motivation. Healthy grocery shopping can actually be fun if you have the right app. Fooducate makes you aware how healthy are the items that you buy. All you have to do is open the app, scan the barcode, and then you’ll get all the info you need. In addition, the app can also track your hunger levels, mood, and sleep. Along with health, the key to leading a good life is being happy. This app uses science-based strategies developed by psychology experts to help you improve your satisfaction and well-being. When you open the app for the first time, you will have to select a “track” (such as reducing stress levels, finding more me time, conquering negative thoughts, etc.) that you’d like follow. Once you choose your track, you’ll get short tasks on a daily basis that will help you lead a happier and healthier life. Whether you’re training for a marathon, or just trying to beat your best mile time, Runtastic is the best app for runners. Runtastic lets you track your runs, including distance, duration, calories burned, and more. You can also track your performance over time, compete with friends, and find local running routes that are sure to challenge you. Share your best times on Facebook to keep yourself accountable and motivated! Flo isn’t just a period tracker. With a beautiful and simple-to-use interface, Flo also tracks ovulation, steps, and mood, in order to provide insights into your cycle over time. Better predict the beginning of your period, and gain a better understanding of how hormones are affecting your mood around this challenging time. Fail to get a solid 8 hours of sleep, and you’ll start to notice a variety of negative effects on your body. Sleep Cycle tracks the quality of your sleep, and your sleeping heart rate using the accelerometer inside your iPhone (the part that knows when you’ve turned your phone sideways). Simply place it on your pillow while you sleep, and let it accumulate data. Sleep Cycle even has a “wake up phase” feature that will wake you up at the optimal time before your alarm goes off. If Sleep Cycle senses you tossing and turning 20 minutes before your official wake-up time, it will wake you up then, instead of closer to your official wakeup time, when you may have fallen into a deep sleep again. Do you have a difficult time focusing at work? BeFocused is based on the Pomodoro Technique, and features a timer that breaks down a task into 25 minute intervals with 5 minute breaks in between. BeFocused has a simple interface, and lets you record tasks and check them off your list, adding to a sense of accomplishment throughout your day. Rowkin has its own companion app for newer generation true wireless earbuds(Ascent, Bit Charge Touch, Micro Touch, and PACE). Music is the ultimate motivating tool for working out, studying, or commuting. Customize your sound profile to your exact listening preferences, check your battery life, and get convenient access to our Quick Start Guide page should you need to troubleshoot your device. The best feature is the “Find My Earbuds” feature, synonymous with the “Find My iPhone” feature. If you lose an earbud, you can easily locate where it was last turned on. Have any other useful and free health app suggestions? Let us know in the comments below!